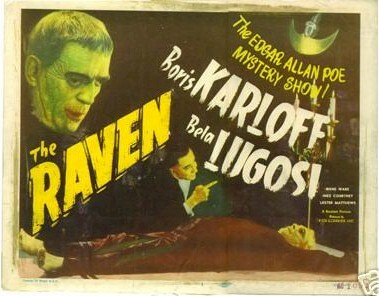 Awesome image from legendary Universal Horror film, "THE RAVEN", starring Boris Karloff and Bela Lugosi. This is lobby card #1, the title card, from the 1948 Realart Re-release. This is not a reproduction. Tiny embossed F.N.S.S. symbol bottom right at rubberstamp. The streaks in the border and below Karloffs ear appear to be gold paint, who knows why. Corners a bit dingy. Card feels sturdy, looks stunning. Because it's not a reproduction, it shows some wear, but mostly on the back side, which no one sees anyway. Brown paper tape along 2 sides and in 2 places at center, this is on the back. Brown tape is stable and archival, and because of the tape, there are no rips to report. Four pinholes to left of Lugosi's head, and one below his hand.